Olga with her son Robert Park, who worked for Canada Post, circa 1980. Olga's rental cottage on Alderside Road in Port Moody, BC, where she lived on her own for many years following her husband's death. It was during these 'cottage' years that Mrs. Park developed her communion service and received 'learners.' The cottage is no longer standing. Olga and grandson Jim, c.1980. Jim and many of his friends regularly visited with "Granny" throughout the 1970s and '80s. Almost everyone started calling her "Granny" during this time. Olga playing her autoharp, which she used when singing hymns during the communion service. Mary Olga Park was born on February 24, 1891 in Gargrave, Yorkshire, England and died on Dec. 13, 1985 in Vancouver, Canada at the age of 94. She was married to James Fleming Park, a banker, on March 24, 1917 in St. Luke’s Anglican Church, South Vancouver. She had two sons: Robert Bruce Park (b. 1919), and James Samuel Park (June 4 to 6, 1922), who died a few days after his birth as described in Between Time and Eternity. 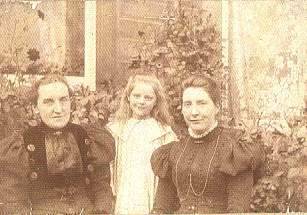 Her mother Ellen Bracewell (1860-1943) was a nanny for the local gentry and her father Bruce Bracewell (died 1941) was a tradesman and interior decorator for the great manor homes in England. His ancestors had been weavers. Olga was sickly as a child in England, suffering from a disorder of the eyes. Through her mother’s connections, she was admitted to a children’s hospital in the Yorkshire countryside where she lived outdoors for long periods, relatively free from the pressures of school. It was during this time that she developed her deep appreciation of nature. She loved reading, showed an early talent in music, and possessed a beautiful soprano voice. Though denied music lessons because her family could only afford lessons for her older brother Ben, she learned to read music by hiding behind the parlor door and listening in on his lessons. After the teacher left, she would copy down musical notation he left on the slate above the fireplace. She attended various schools in the suburbs of Birmingham until the age of fourteen when she won a scholarship for a local teacher’s training school. Oddly enough, it wasn’t the “story” in each one that left a lasting impression, but the incidentals of circumstances—travel by horse-drawn sleigh over the snow-enveloped tundra of Siberia, searching for fossils of a little girl in Australia, learning to read and write of a girl in Germany, escaping from the hired assassins of the church on Bartholomew’s Eve in France, finding an old letter in a secret drawer of an old desk. These incidentals made me aware of places and ways of life that I would not normally have heard of. They stimulated my thinking about the life of other places. This spirit of adventure and mystery in the “incidentals” of everyday life remained with her throughout her life. Her bookshelves included biblical commentaries, Bunyan’s Pilgrim’s Progress, Shakespeare, Tennyson and many of the classics of the western mystics. As a child, she attended prayer meetings until Darwinian debates broke up her local Wesleyan church. Many people left because they found a literalist interpretation of the origins of mankind incompatible with the more recent findings of science. Olga’s cousins, however, were high Anglican, so despite parental disapproval, she sneaked off to attend the St. Thomas Anglican Church nearby, drawn by the music, liturgy and sacramentalism. In 1910, when she was nineteen, Olga and her family immigrated to Canada. The unsolicited psycho-spiritual experiences she describes in Between Time and Eternity and An Open Door began around 1914 and earlier. The transition to Vancouver was difficult, as Olga was forced to abandon a promising musical career in England where she had social connections and educational opportunities. She describes the Vancouver of the early days as a place of pioneer conditions with few cultural amenities. When she first arrived, she was greeted by a stark landscape containing miles of blackened stumps. Her father first worked out of Revelstoke for the Canadian Pacific Railway. Later, her parents farmed in South Vancouver where one of her fondest memories was delivering milk in the winter by horse and sleigh. Her father, a dairy farmer on River Road, became involved in the local union as one of the organizers of the “milk board.” Olga loved animals and horseback-riding. As a young woman she worked for the telephone company for a short while and for a time considered becoming a nurse. Her two elder brothers, Ben (the eldest) and Maurice, both predeceased her. Maurice Bracewell was chef at Banff Springs Hotel and later settled in Duncan on Vancouver Island. Maurice suffered a shrapnel wound during the First World War and was shell-shocked afterward. He is the brother she mentions in Chapter 1 of Between Time and Eternity who saw Vimy ridge explode after she had pre-cognition of the event. In 1917, Olga married James Fleming Park, a Vancouver banker working for the Canadian Imperial Bank of Commerce who was originally from Glasgow, Scotland. They lived in various residences in Vancouver. Throughout these years, she taught Sunday School, developing innovative educational curriculum for youth. During these years she had several miscarriages. Mrs. Park continued active all her life in music, and was during the 1920’s a leading member of St. Mary’s Anglican Church Choir in Vancouver. Once she was asked to take on the lead soprano role in Handel’sMessiah, but missed her big opportunity by coming down the evening of the performance with a severe sore throat. Her sense was that the door to public acceptance as a musician had to be closed in order that she might develop her other spiritual capacities. She was a born storyteller who could hold the attention of adults and children alike with her lively and often humorous anecdotes. She told of how a group of disaffected teenage boys used to linger outside the door of her Sunday School classroom pretending not to listen in as she dramatized stories from the gospels, and later repeating the stories to their friends. She had a way of bringing events from the Bible into the present. In mid-life, Olga embarked on a detailed study of scriptures in light of what Jesus might have really said versus what the developing church might have placed in his mouth through editing of the gospels. Eventually, she left the church because of her sense that much of what she called “Churchianity” of her times was not in alignment with the actual teachings of Jesus. Mrs. Park’s parents eventually retired in Whonnock, B.C. where she used to visit them in the days when a journey to what is now an hour's drive was a major undertaking. Olga tended her mother in her mother’s final years. 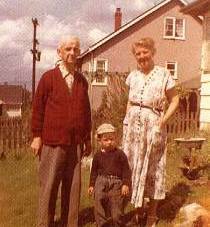 After her husband’s death in 1959, she lived with her son and daughter-in-law in South Vancouver. Then in 1964 she moved to a small cottage in Port Moody on Alderside Road on the Burrard Inlet where she enjoyed her garden, wildflowers and walks to the corner store. At this period of her life, interested “seekers” of all ages and walks of life who heard of her by word of mouth or through her self-published writings began to visit. Some of those who came seeking spiritual direction became her “learners,” receiving instruction in her simple eucharistic practice. She insisted constantly that whatever “society” formed about her was ultimately an interior one, and that she did not wish to form a club or group structure of any sort, certainly not one involving dues, membership, official status or doctrine. The first of these “seekers” was a young man, Brian Longhurst, who came upon Between Time and Eternity in a religious bookstore in Vancouver and tracked down its author. He was followed by others who met with her for Bible studies, prayer, and contemplation. In these later years, Mrs. Park wrote and self-published her spiritual writings, consisting of detailed records of her visionary experiences, Biblical studies, philosophical reflections, theology, and studies of the mystics. She also retreated from time to time for periods of silence and contemplative prayer, but kept up a steady correspondence with friends and associates. She was not a recluse, but had active views on local issues and civic affairs. Mrs. Park continued living alone at the cottage until 1978, when at the age of 87 she moved to Vancouver due to frailty of health after breaking a leg. 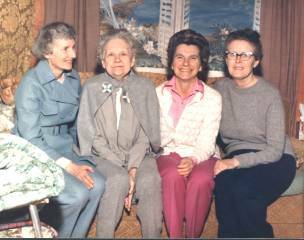 There, she lived in the basement suite of a friend until January 1983 when, due to advancing age, she moved to a care center for the elderly in Vancouver. Olga Park passed away in December of 1985 at the age of ninety-four. Her son Robert died a few years later. Her two grandchildren, Jim and Valerie, currently live in Vancouver. 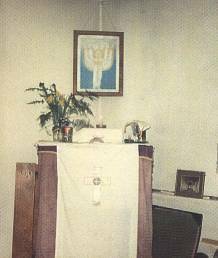 This home worship altar was where Olga prayed and practiced her communion service. She felt that everyone serious about developing their spirituality should have an inconspicuous altar in their home. The pastel artwork on the wall behind her altar is her own, portraying her vision of Christ among the seven branch candelabra, similar to that described by John of Patmos in Revelation 1. Rev. Charles Sydney McGaffin, was the rector of St. Mary's Anglican in Kerrisdale, Vancouver, from 1919-1935. This is the "Rector" of whom Mrs. Park writes that she psychically heard the text of a sermon he was to preach hours later that morning, while she was cleaning out her bath tub. Mrs. Park had great spiritual affinity with Mr. McGaffin, and though she left his parish to avoid giving fodder to gossip-mongers who suggested their friendship was "too close," she had much contact with him after he passed away. In her later years, she was aware of him on a daily basis -- a very close friend in the spirit world who was able to communicate with her on spiritual matters. He is sometimes referred to as "C.S." in her book Between Time and Eternity.